My Place: Princesses, Roosters and Dancing! At last! I can do art again, albeit mainly with my left hand. Below are my efforts of this week. While I was laid up I took the opportunity to search out all those blogs I had heard of but never had the time to visit. I discovered some awesome artists. Two were so inspiring that I had to attempt some of the lessons learnt. First of all Teesha Moore. I sat and watched her videos yesterday morning on journaling. Last night I sat in front of the TV and cut merrily bits out of magazines. Sometimes things are meant to be. In the weekend I was given sacks of glossy magazines by my friend who is selling up and with her husband they are buying a giant caravan and are going to tour NZ for a couple of years. I was to pass them around my friends! Somehow I don’t think they will get a look in! I managed to stick some bits on two journal pages that i already had painted a while back. This morning I was going to look for a face for my Princess but gave up when I realised that I preferred to make my own face. So after Physio, this morning I painted her face and added the houses. I did the text as well, not happy with it. But, not too shabby considering I was using my left hand. I looked at the page above and it came to me I want there to be a rooster, think I will have to draw one or cut out a rooster head and put it on a human body. The idea is to have text with the rooster crowing about all the blessings it has. I couldn’t resist the gnomes. They are slightly sinister and I thought they could represent the negative thoughts we have about ourselves. I am happy with these but conscious that they scream Teesa Moore! I think as I do more of them my style will emerge. 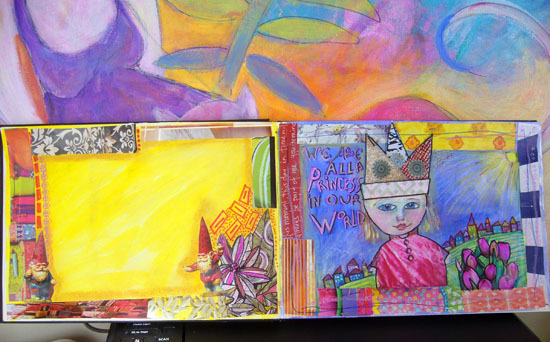 The other art that blew me away was Flora Bowley. I have heard many of you mentioning her so googled her and found amazing art. I watched her video last weekend and it really got me out of my pity party. I thought I could do that with my left hand and first thing on Monday got out an abandoned canvas and started. I didn’t do her dance, I would have tripped over my crutches! But I let my hand dance with the paint. Below is about three to four layers of paint, It is a reasonably large canvas 30in x 24in, and I got really messy doing it, some tell-tale paint on my sling too! Hehehe. I was really happy with this and then fear set in. What shall I do next I will ruin it etc., etc. 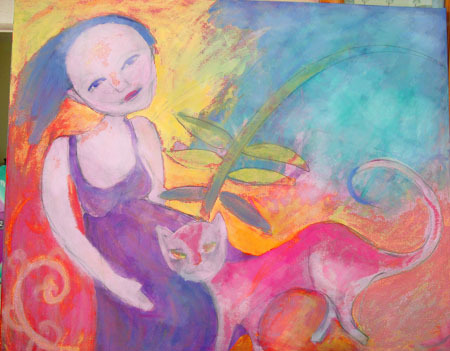 Eventually I got my courage up and drew a dancing girl and cat and started to add paint. It is what I call at the ugly stage and I wasn’t going to post it till it was at a better stage. But I stopped myself and told myself, who cares! I think because I am getting to the stage where I want to add detail, I am finding my left hand is not capable of doing what I want, I have frustration. But that will end as my right arm gets better. As surely it is. I can hold scissors and cut out, I can type now and hopefully next week I will be paint to do some painting! But, I won’t push it, as being without its use has taught me how much I value it, so I won’t stuff the healing up. Great to be back, and have a awesome Paint Party Friday weekend everyone. Sharon, I love that dancing girl with her cat. I thought you are already done with it. To me it seems to be at least. Just beautiful! Glad you are on the mend now Sharon and great to see your lovely colourful artwork. You just mentioned 2 of my absolute favorite artists! I love teesha's collages so much, but you're right, it takes a while to find your own style. 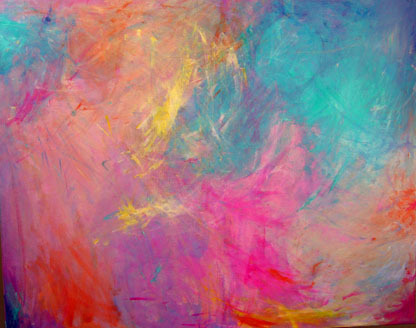 And flora Bowley has totally changed my style of painting. I love what you did so far, the colours are so vibrant and there's a lot of movement in there. Glad to hear that your arm is on the mend! welcome back Sharon, lovely work! Sharon, that's pretty impressive work you have done with your non-dominant hand! Bravo! Applause!! Well done! Your style is shining through! HPPF! I have Teesha Moores book but I've never been able to get that looseness she has. Your work here is beautiful. I especially like Dancing Girl with those enormously wonderful colors. So sorry you have had to resort to your non dom hand...but your work is wonderful. Love your color, your girl and especially your cat. You may not want to go back to your dominant hand by the time this is all over. 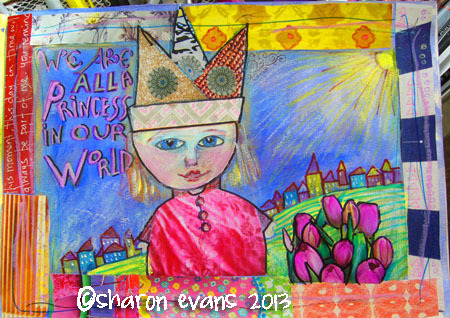 I love this post and all your fearless art projects Sharon. Good for you!!! Your magazine pages are wonderful and I can't believe you've done such great work with your non dominant hand. Really inspiring! I love all of your pieces here, Sharon! I LOVE all the bright colors in your pages, as well as the fantasy like imagery. I'm glad you hand is doing better. Blessings! i love your paintings and i'm so amazed you were able to do it with your left hand! I'm curious now about these 2 blogs so i think i'll check them out too. I hope you are better soon! Hi Sharon! Thanks for commenting on my blog! Through reading your post, I discovered Teesha Moore! I've now spent a couple of hours watching her journaling videos. I can see why you love her - and I think you did a wonderful job with yours! And you did all of this with one hand? Amazing. Glad you are getting back into the swing of things, but sounds like you used your time well! Glad things are looking up!! Love your Flora Bowley influenced painting...so cool, and the cat wow...a great piece!! Also your Teesha Moore piece is wonderful too!! You have done a fantastic job of all these with your left hand, I love them, they are so very spontaneous, it's great to let the left hand in a while anyway, you paint and draw more with your soul that way...it's been so great visiting here and good to know you are well on the mend, take care, be patient and continue on with all this soulful beauty! Beautiful and so admirable that you can do this with your left hand, while being right handed. Hope your hand mends quickly and you can do everything again just the way you like it. you found some amazing inspiration to help you through this healing time. Can't believe these are with your non dominant hand. Fantastic! Visiting you from AJED. What lovely artwork! Glad to hear you are feeling better. Art will help you heal faster I am sure. I am so glad you are feeling better Sharon...welcome back, albeit left handed, which I can hardly believe because these pages are magnificent! Lovies, Samara p.s. the colors are amazing on all of them!!!! 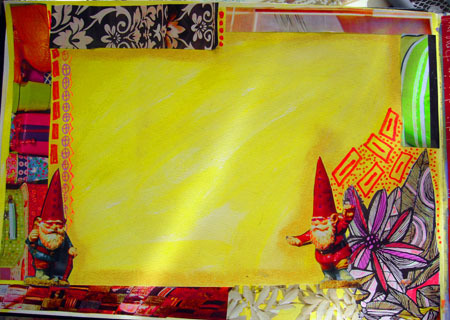 Beautiful journals pages - I can't believe you are using your non dominant hand! I cant imagine painting or creating with mine! I love your dancing girl. The smooth and soft Colors are so beautiful! The colors in your painting are so beautiful and left handed style just adds to the beauty! Wishing you speedy healing! Oh I just love your princess! HPPF!